This is a story written by Teresa Marie, who is currently raising funds for her son, Vinnie, who was born with EB (Epidermolysis Bullosa). We, MustangCarPlace, want to help her by spreading her story to our readers. Please take some time and read her story below and follow the link at the bottom of the article to the full story where you can read the full story and also donate to her son. “ For anyone who is a car enthusiast, I know you will understand completely why I have chosen to share our story regarding a Mustang Shelby GT350. I have a 32 year old son, Vinnie, who was born with a very rare disease that limits him from living his life like the average person. Any type of friction or trauma causes his skin to come off because he is missing the anchoring fibers that hold it in place. The result is open wounds, similar to third degree burns, that leave behind severe scar tissue. There is no cure, and the only treatment is protection and prevention. Statistically, we were told Vinnie probably wouldn’t survive his 18th birthday. He has well surpassed that, and he is still fighting hard every day of his life to keep on going. Protection of the skin from friction and trauma requires bandaging almost his whole body, while prevention is almost impossible. In order to live a normal life as possible, I always figured out a way to let Vinnie try everything he wanted. Despite the physical limitations, he grew up loving sports and sports cars. Two loves that are the farthest things you would imagine doing with this disease! However, his love has given him a knowledge of both these subjects that goes beyond comprehension. 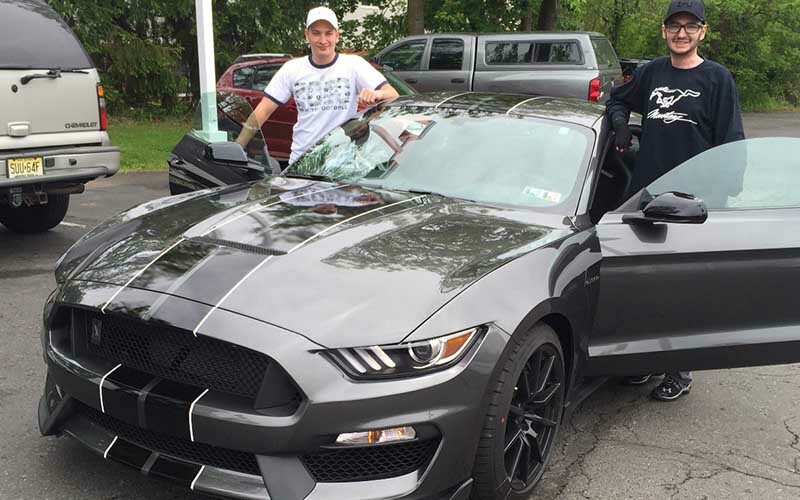 His need for speed was fulfilled three years ago, when he and his brother purchased a 2016 Mustang Shelby GT350. This gave them the opportunity to visit the Ford Performance School in Utah. After a full day of instruction, they had the privilege of driving on a track! That whole experience is priceless!